Laurier is about giving back all year round, but we have some special events and stories to share for Laurier Cares week, taking place from Feb. 8 to 15. Each day, Laurier’s students, staff and faculty make a difference in our internal and external communities. Join us at one of these events to experience the ways Laurier gives back. 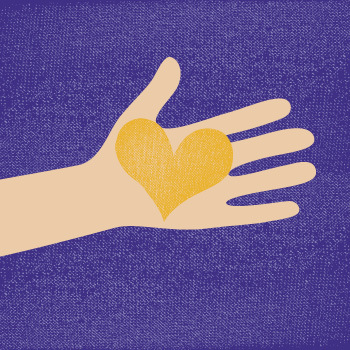 We also invite you to use #LaurierCares to share your own stories about Laurier’s giving. In addition to the #LaurierCares hashtag, new purple-and-gold heart frames and geofilters will be available for use on Facebook and Snapchat so you can visually show how you care. The Facebook frame can be used anywhere at any time. The Snapchat geofilter will be available from Feb. 8 to 15 around the Fred Nichols Campus Centre at Laurier’s Waterloo campus. Many of the institutional social media accounts will also be sharing information about upcoming events and great stories, and we encourage you to retweet and share those as well. Save up to three lives by donating blood. The Laurier University Charity Kouncil (LUCK) will be hosting their semi-annual on-campus Blood Donor Clinic. If you are interested in donation, contact luck.wlu@gmail.com, or sign up in the concourse one week prior to the clinic. Laurier is a part of Canadian Blood Service’s Partners for Life program, in which we commit to an annual blood pledge. If you are unable to donate during the drive, ask the reception desk at your next blood donation appointment to have it count towards Laurier’s pledge. Between Thursday, Feb. 8 and Thursday, Feb. 22, Laurier alumni and friends are being asked to donate used luggage to the non-profit organization, Not Just Tourists. Laurier’s Toronto office has been designated a luggage drop-off site for these two weeks, in addition to the Alumni Hall in Waterloo. Not Just Tourists is a non-for-profit, non-religious, non-political humanitarian organization that provides donated medical supplies to clinics in developing areas that are in immediate need. Your luggage donation will be used to ship these medical supplies to hospitals and clinics abroad. Donate a suitcase and get a $20 voucher to Lou Dawg’s Southern BBQ! Lou Dawg’s Southern BBQ giveaway donation provided by cofounder, CEO and Laurier alumni, Daryl D'Souza (MBA ‘07). Graduate students are invited to connect in the Healing Space. The GSA office, in partnership with CMHA Self-Help, is offering a space for graduate students to share and support each other through their everyday challenges. Join the Sustainability Office in Waterloo Region’s carpool challenge by sharing rides to work and saving carbon emissions and money, while having fun! There will be four challenges over the month of February with the chance to win great prizes. The week one challenge is to start a carpool for the chance to win a $150 Downtown Dollar Gift Certificate. Watch your Laurier email for more details from the Sustainability Office. The Beckett School at Laurier invites you to take part in creative art group activities in a fun environment that fosters creativity, exploration and experimentation. The curriculum teaches not only a variety of art techniques and mediums, but also self-reflection, imagination and knowledge of different cultural art traditions! See the above description under Feb. 8 for details. The week two challenge is to log your carpool trips for the chance to win a $150 Downtown Dollar Gift Certificate. Watch your Laurier email for more details from the Sustainability Office. Time: 12:15 p.m. – 12:50 p.m.
Join us for an information session with KW Counselling, one of United Way's partner agencies. Feel free to bring your lunch to this event; refreshments and dessert will be provided. There is no fee for this event, but we ask that you RSVP using Eventbrite. The Laurier Library is launching “Maker Mondays,” a space for students, staff, faculty and community members to bring in projects to work on or chat with other ideators about what you’d like to make. The makerspace currently offers a 3D printer, sewing machine and some electronics, such as the Raspberry Pi. Join the Indigenous Student Centre for their weekly soup and frybread lunch. In partnership with Laurier’s seminary, drop into the Delton Glebe Counselling Centre for Chilling with Dogs. Weekly, the centre offers a chance to de-stress with their four-legged friends. Dog treats and puppy snuggles provided. Location: graduate students’ study spaces, labs, grad offices and GSA office after 2 p.m. The GSA’s Wellness Committee will be handing out candy grams to spread the love to graduate students. Look out for them around campus, or come by the GSA Office after 2 p.m. for a treat. Laurier International, the YMCA, and the Laurier Library are hosting a games night for international students and newcomers in our community. The program was developed to bring together members of the community through gaming and to encourage the development of friendships and English-second language skills. This event reoccurs on Wednesday evenings until April 4, 2018. For more information, visit the Games Night event listing. Join the Wilfrid Laurier University Students’ Union in recognizing Random Acts of Kindness Week (celebrated Feb. 11-17). The entire Laurier community is encouraged to spread kindness! For undergraduate students participating, take a photo of your kind gesture and tag #RAKDay on social media for a chance to win prizes.